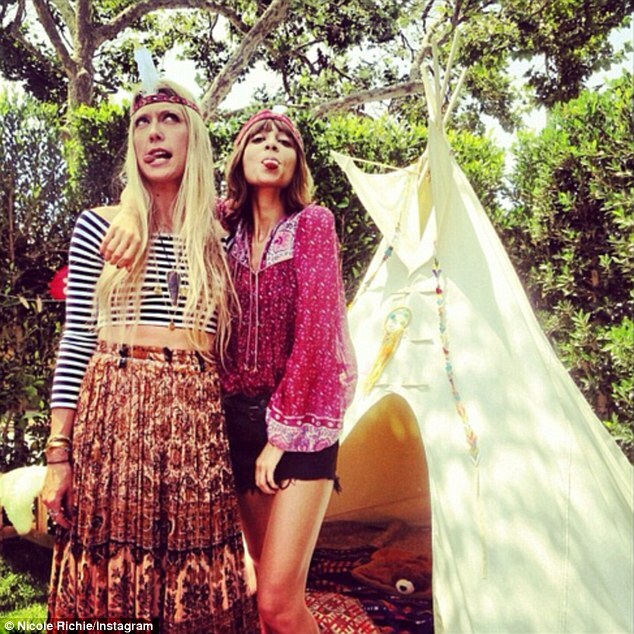 Newspaper Rock: Nicole Ritchie dressed as "Indian"
By Cassie CarpenterShe is no stranger to controversy and Nicole Richie is facing new criticism for a photo shared on her Instagram page. Nicole posted an Instagram snap of herself on Saturday wearing a feather headband in front of teepee there were bound to be offended fans. 'Another Saturday Night,' the 31-year-old reality star wrote to her 1 million Instagram followers. In the outdoor 'pow-wow' shot, Nicole and her blonde gal pal stick their tongues out while wearing identical headbands. The photo was met by criticism from some fans of the star, who lambasted her decision to post it and branded it insensitive. Back in 2010, Nicole posted a similar black-and-white shot of herself working on a laptop while wearing a feathered war bonnet. Comment: In related news, Nicole Ritchie is still alive. What a relief. The second photo is worse in terms of stereotyping, of course. Pure hipster in headdress. The Daily Mail correctly linked these photos to the Victoria's Secret and No Doubt controversies, and then to violence against Native women:Sexual assault rates against Native American women are reportedly higher than most other ethnic groups, and No Doubt immediately apologised for romanticising the much-beleaguered community.Nice to see one newspaper gets it without making excuses or feeling the need to present the other side (like, "she didn't mean to caricature Indians with her stereotypical costumes"). It's racially insensitive, period. For more on the subject, see Half-Naked Drummer Dressed as "Indian" and Anthropology Students Dressed as "Indians". Wait, you're reading the Daily Mail? Rob, hand in your liberal card now. Also, when the Daily Mail is incensed about a racial incident, you know it's racist.